ID: Long stalk anchored to the bottom. Gas-filled floating bulb at end of stalk with multiple long fronds. 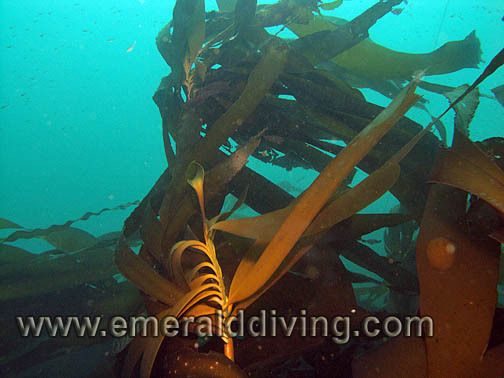 Comments: Bull kelp is a signature kelp species of the NW. 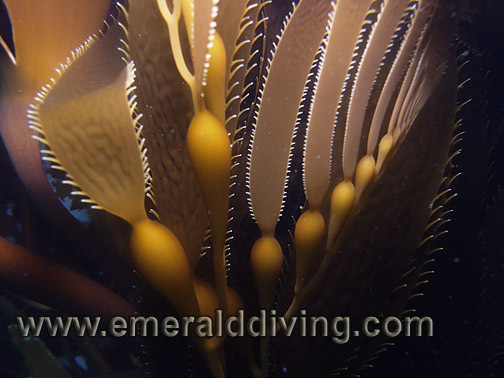 This kelp is the largest and fastest growing of our kelps, growing up to 12" a day during summer. 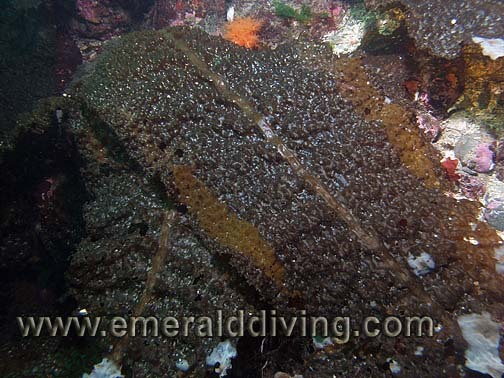 Usually found anchored in shallow rocky areas < 40'. 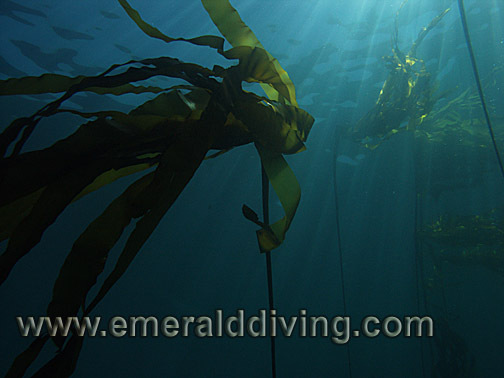 Huge forests of this kelp are commonplace in the San Juan Islands, Strait of Juan de Fuca, and Cape Flattery. Like all kelp, bull kelp is an algae. ID: Semi-transparent ruffled green fronds origination from a common step. Comments: Sea lettuce often dominates the shallows on many areas in summer months. I usually do not find this algae deeper than 20 feet. Come late fall, the annual sea lettuce tends to disappear. The head of sea lettuce often is attached to a small rock. There are multiple species of this sea lettuce. Photo taken at Three Tree Point in Puget Sound. ID: Multiple reddish brown branches that sprawl across the bottom. Comments: Another annual seaweed that thrives during summer months, but dies off come late fall. 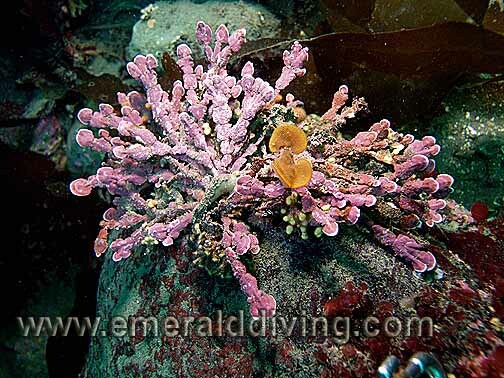 Succulent seaweed is common in shallow areas along soft substrates. 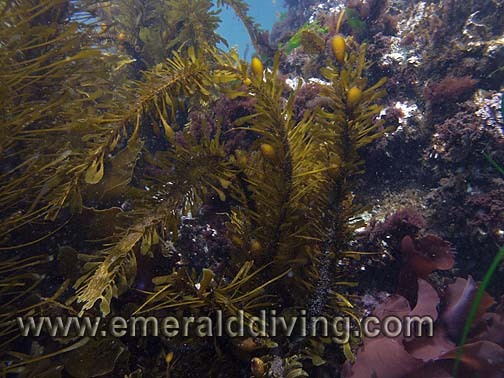 Like all these shallow seaweeds, this seaweed provides important cover for juvenile fish and invertebrates. Photo taken at Three Tree Point in Puget Sound. ID: Brownish-red leaf riddled with numerous holes. 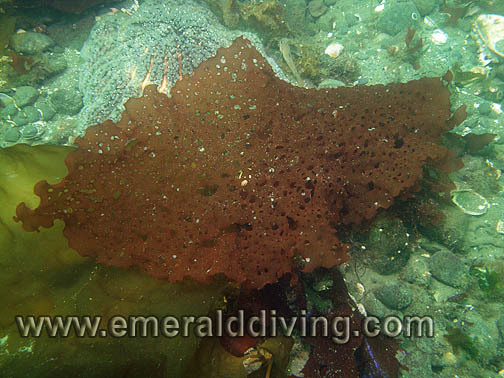 Comments: The holes in this red algae are natural - they are not the result of predation. 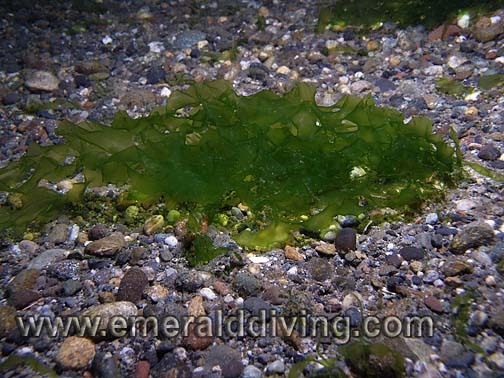 This is a common algae found during summer months at shallow to moderate depths throughout Washington waters. Photograph taken at Flagpole Point in Hood Canal. ID: Distinctive congregations of red bulbs. Comments: This is a very distinctive form of seaweed. The bulbs are filled with a gooey glycoprotein. 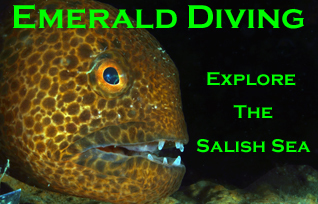 This species is readily abundant at shallow to moderate depths in parts of Hood Canal. Photo taken at Pulali Wall. ID: Distinctive iridescent blue or sometimes green colored fan-like blades, sometimes with black spots. 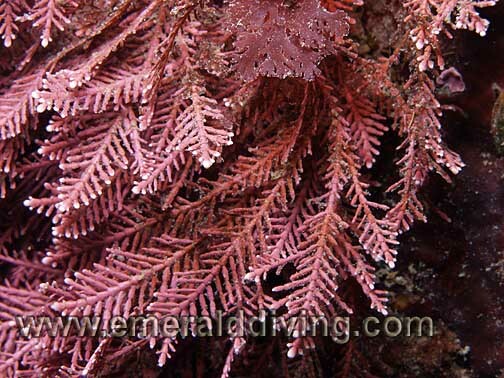 Comments: This is another common red algae seaweed that I generally find above 60 feet along rock structure subjected to decent currents or swell. 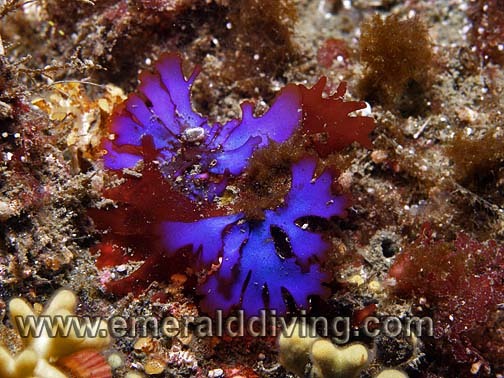 The iridescent blue is the result of gland cells on the surface of the blades. Photo taken at Mushroom Rock in Cape Flattery. ID: Long, flat green leaf blades, usually grows in dense beds on shallows soft substrates . White, hair like roots. 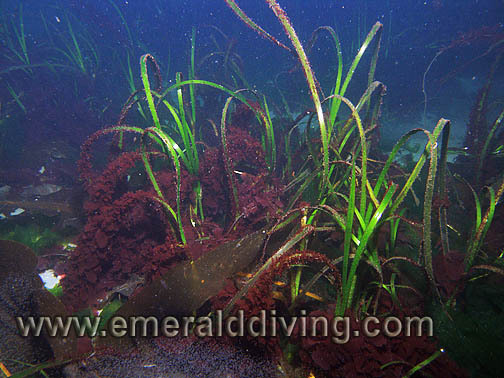 Comments: Eelgrass beds serve as a nursery for all sorts of marine life. 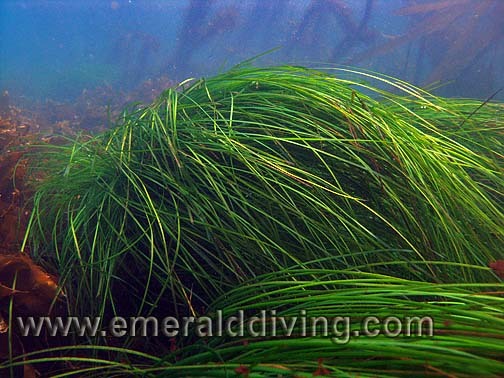 Many of the eelgrass beds in Puget Sound are disappearing. These beds provide protection and cover for small fish and invertebrates and are critical to the well being of our marine ecosystem. Photo taken at dusk at Sekiu Jetty Rocks. ID: Numerous bulbs emanating from a common stalk. Each bulb is proceeded by a a long, flat blade with serrated edges. Tends to grow in thick beds. Comments: I typically only find this magnificent algae dominating some of the rocky habitats along the Strait of Juan de Fuca and Cape Flattery area. Like bull kelp, northern giant kelp beds play an important role in the marine ecosystem providing cover and habitat for smaller fish. Photo taken at Third Beach Pinnacle. ID: Dense growths of thin, rounded blades. 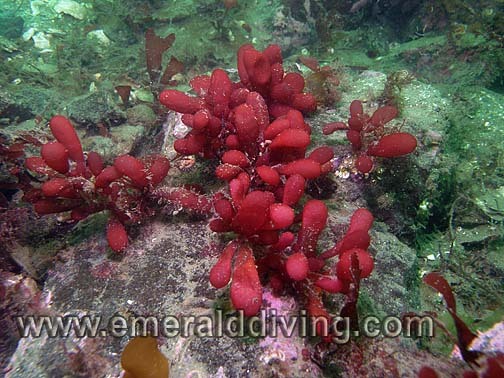 Grows in shallow (<10 feet) rocky areas exposed to swell. Comments: Several species of surfgrass are captured in this entry. Surfgrass grows rampant around the rocky structure surrounding Tatoosh Island. I only note this grass in areas subjected to constant light to moderate swell. 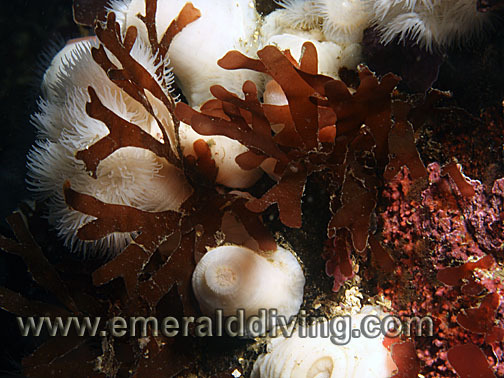 Photo taken at shallow depth (5 feet) at Pile Point on the south side of San Juan Island. ID: Dominate mid-rib with numerous branches containing smaller leaflets. Tan/brown in color. 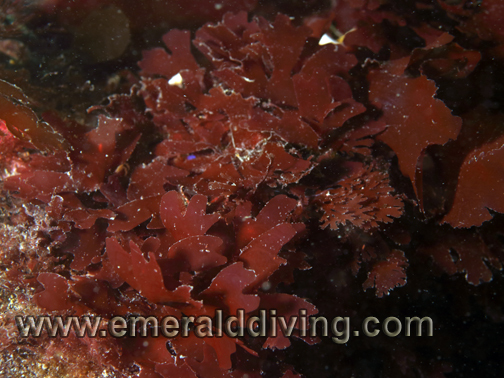 Comments: I only note this species of red algae when diving the Cape Flattery area. Photo taken at Slant Rock near Cape Flattery. ID: Branches consisting of round and flat bead-like segments. Purple/pink in color. Very brittle. Comments: I often note this beautiful algae at shallower depths in exposed areas in the San Juan Islands and Strait of Juan de Fuca. Photo taken at Eagle Point in the San Juan Islands. ID: Long narrow stem (stipe) supporting numerous thin 2-4" blades attached to the stem at a right angle. Occasional floatation bulbs also attached to the stem. Brown to olive in color. Comments: Feather boa is a beautiful kelp that I often find thriving in semi-exposed waters in the Strait of Juan de Fuca. This kelp can reportedly grow to 20' in length. Photo take at Pile Point on the south side of San Juan Island. ID: Numerous long, flat, straight blades 2-4" wide emanating from a common stock. Brown in color. 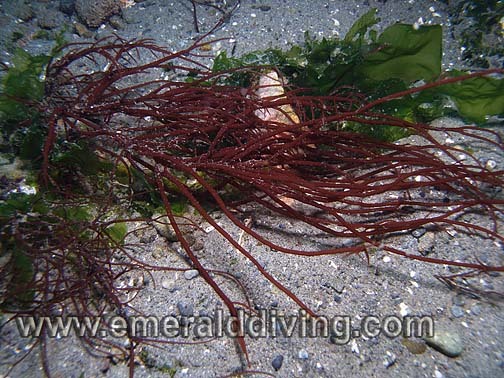 Comments: I find dense collections of this kelp throughout the San Juan Islands and Cape Flattery area at depths above 50 feet. It seems to thrive on at least some exposure to swell and waves. Photo taken at Slant Rock near Cape Flattery. ID: Numerous feather-like branches. Pink in color. Branches are relatively narrow and flat. Comments: I only note this corraline when diving the shallows of semi-exposed areas in the San Juan Islands and Strait of Juan de Fuca. Photograph taken at Eagle Point on south San Juan Island. ID: Flat, branching arms with rounded ends emminating from a common trunk. Reddish-brown in color. Comments: This seaweed is a red algae that lives in rocky, current swept area and is adept at living in the shadow of larger varieties of algae, such as kelp. Photographed in Browning Pass admidst a field of kel and white metridium. ID: Reddish leaf with ruffled edges. Comments: This species is typically found at shallow depths. 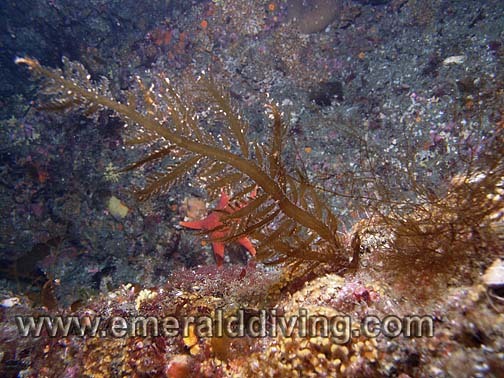 Photographed at current swept Whale Rocks in San Juan Channel. This species must have a good footing as current can rip at this location.